Aitor Karanka was pleased with Real Madrid’s 2-1 win over Barcelona in the second leg of their Spanish Supercopa encounter at the Santiago Bernabeu on Wednesday, but feels that the Liga champions could have won by an even bigger margin. Goals from Gonzalo Higuain and Cristiano Ronaldo helped Madrid to a 2-0 lead before Lionel Messi pegged one back, but the Catalans were unable to add another, and saw los Blancos win the Supercup on the away-goals rule. “The team went for it from the very beginning and the game went our way with the early opener, and then a little bit more with the sending off,” Karanka stated at the post-match press conference. “We created a lot of chances. I think our win was fair, especially after watching the first half. The result is a fair reflection of what happened on the pitch. “If we had scored all the chances we had in the first half, it would have been an even fairer result. It was a game for a title and this was the result we needed after the loss from the first leg. Madrid resume La Liga action on Sunday when they host Granada. Emilio Butragueno has hailed the performance of new Real Madrid signing Luka Modric after Jose Mourinho’s side claimed the Spanish Supercopa on away goals with a 2-1 victory over Barcelona at the Santiago Bernabeu. After being introduced as a late substitute, the former Tottenham man added a fresh energy to the Madrid attack, and almost netted his first goal for the club with a well-struck effort that was cleared from under the crossbar. The former Blancos striker, and current director of international relations, went on to praise the attacking verve shown by Madrid in the first half, where goals from Gonzalo Higuain and Cristiano Ronaldo, coupled with Adriano’s sending off, looked to have put the tie beyond reach. After racing into a two goal lead against the sluggish Catalans, Lionel Messi’s 35-yard free kick put the Blaugrana back in touch, and only a number of fine Iker Casillas saves prevented Tito Vilanova’s team from snatching the trophy. Barcelona coach Tito Vilanova has hailed the character of his side, despite their 2-1 defeat to Real Madrid at the Santiago Bernabeu in the second leg of the Spanish Supercopa on Wednesday. A poor start for the Catalans saw them fall two goals behind early on, before Adriano was shown a straight red card to leave them on the brink of defeat after only half an hour. However, Lionel Messi reduced the arrears with a free kick on the stroke of half-time, and Barca recovered to give Madrid a run for their money during the second half, an improvement that was not lost on their coach. “The first half was not like us, but the second half was one of my proudest nights with the team,” Vilanova told reporters after the match. In the 221st meeting between the two sides, Los Blancos’ triumph sees them move ahead of Barcelona 88-87 in the all-time ranking for Clasico victories. Real Madrid have claimed the 2012 Supercopa after a gripping 2-1 second-leg victory over Barcelona in their Santiago Bernabeu clash on Wednesday. Los Blancos triumphed 4-4 on away goals, but it should have been a lot more after a shambolic defensive start from Tito Vilanova’s men. A missed clearance from Javier Mascherano saw Gonzalo Higuain gifted the opener, and an outrageous move from Cristiano Ronaldo on Gerard Pique put him in position to make it 2-0 after 19 minutes. Adriano’s red card just before half an hour seemed to signal the the end of Barca’s hopes, but Lionel Messi dragged them back to their feet with a fantastic free-kick on the stroke of half-time. The second-half was far more tense as a much-improved Barca had their chances to score again, but there was no way back for the visitors as Madrid hung on to claim the first trophy in Spain this season. Pepe returned from a concussion to start alongside Sergio Ramos in defence, but there was no place for new signing Luka Modric, who began the game on the bench. An injury to Dani Alves during the warmup, forced Tito Vilanova to draft Jordi Alba in at left-back, with Adriano shifting to the opposite flank. Carles Puyol was another notable absentee after fracturing a cheekbone in the 2-1 win over Osasuna on the weekend. And the Barcelona captain may have well had a thing or two to say after a dreadful defensive opening that saw Madrid storm into a two goal lead after 20 minutes. Mascherano had already allowed Higuain to slip past him for an early one-on-one that was saved by Victor Valdes, and the Argentine gifted his compatriot an even greater chance in the 11th minute, when his missed attempt at a clearance allowed the striker to steal in and slot home the opener. It went for bad to worse for Barca eight minutes later, as Madrid struck again after pouncing on another lapse at the back. Pique was left bamboozled by a heel flick from Ronaldo, who advanced on goal and had time to steady himself before blasting in via the leg of Valdes. Valdes was called into action once more to deny Higuain, who was again able to get behind the defence, while Madrid saw a third goal questionably disallowed for an infraction after Pepe nodded in a free-kick. The visitors were all at sea, and their chances seemed to be virtually extinguished just before the half hour mark, when Adriano was shown a straight red card for pulling down Ronaldo on a clear break towards goal for the Portuguese. Vilanova was forced to throw on Martin Montoya for Sanchez in a bid to shore up his defence as Madrid continued to dominate. Sami Khedira’s volley was thwarted from point blank range by Valdes, before a last ditch challenge from Mascherano halted Higuain as he bore down on goal. 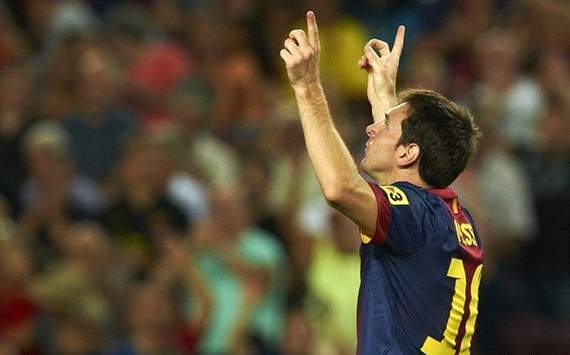 However, there were a few signs of life from Barca as the first-half drew to a close. Montaya came within inches of connecting with Andres Iniesta’s low cross, and then, in stoppage time, a moment of magic from Messi gave the visitors a fighting chance. The Argentine took charge of a free-kick after Xavi was felled 30 yards from goal, and bent a breathtaking effort around the wall, past the outstretched arm of Iker Casillas and into the back of the net. Still, Madrid nearly responded in the dying embers of the first-half. Ronaldo’s 35-yard drive bounced inches wide, and Higuain also narrowly missed, after cutting onto his left foot deep inside the area. Barca headed into the break knowing that the still had a lot of work to do, and looked to wrest control from the hosts as the second-half unfolded. Madrid seemed content to sit back and protect their advantage, which allowed the Blaugrana the chance to dictate proceedings with their famed tiki-taka football. Their improved endeavour was almost rewarded on the hour mark, after a searching ball from the back by Mascherano was taken in stride brilliantly by Pedro, who saw his shot met by an equally fantastic save from Casillas. The Spanish forward had another opening moments later after sneaking in on the right, but Casillas was again alert to stop him from poking home at the near post. Madrid were far from ruthless, but still harboured a significant threat on the break. Khedira nearly scored a third after beating multiple defenders en-route to goal, but Valdes was able to block strongly. Alba was thwarted at the last by a great challenge from Ramos, before Higuain was allowed through on goal for the umpteenth time, but could not finish the chance as his effort bounced off the base of the post. Late openings appeared for both sides, but no more goals were forthcoming as Madrid held on to claim the Supercopa, and set the pace for what is sure to be a enthralling season in Spain. Lionel Messi is Barcelona’s all-time top scorer in Clasico clashes after netting his 15th goal in the fixture on Wednesday night at the Santiago Bernabeu. The Argentine curled home a stunning free kick just before half-time to level the scores on aggregate at 4-4, although Real Madrid have the advantage after netting two away goals in the first match at Camp Nou, which ended 3-2. Messi’s strike sees him overtake the previous Barcelona mark, set by Cesar Rodriguez. The 25-year-old also surpassed the forward’s club record of 232 strikes last season. Fellow Argentine Alfredo Di Stefano, who starred for Madrid in the 1960s, holds the overall record with 18 Clasico goals to his name.